Marinated Halloumi with Sesame, Black Pepper and Oregano. Quick fried Tomatoes, Sweet Peppers and Roast Peppers. 3 Tomatoes on a plate, leaves in the middle, charred Peppers on top with dressing and pickled Shallots. 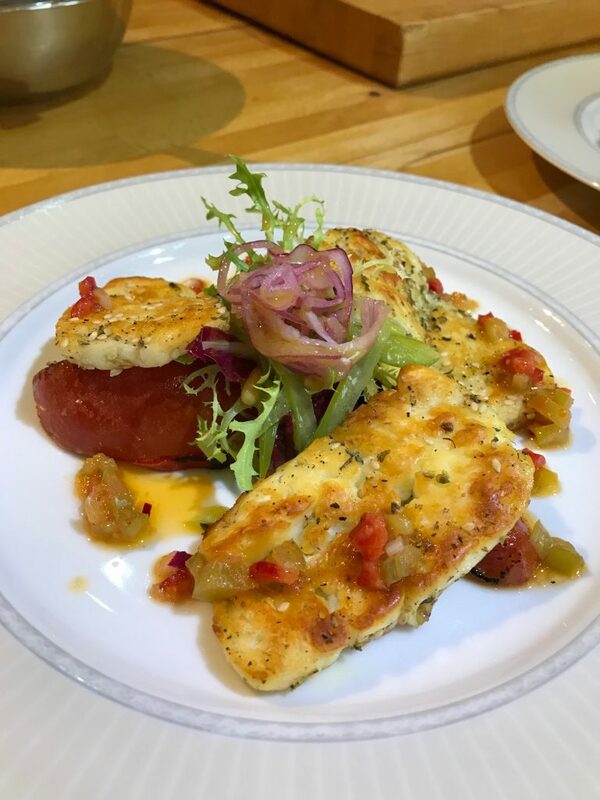 Gill the Halloumi and serve on the Tomatoes. Spoon the Pepper and Sundried Tomato dressing over the cheese. Charred Leeks on the plate, topped with Spinach and Sautee Potatoes with Fish on top. Spoon around the Vierge Sauce. Banana Parfait with biscuit base topped with Caramelised Bananas, wafer thin Pineapple, roast Pineapple and Crumble with Caramel Sauce.